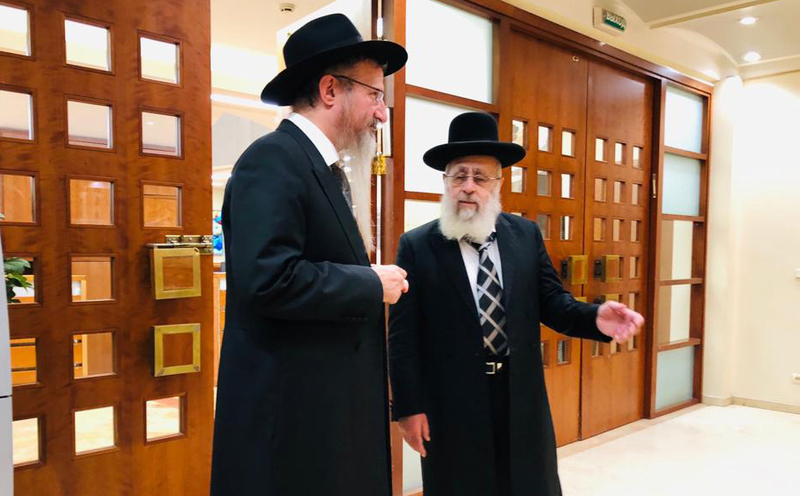 Chief Sephardic Rabbi of Israel, Rabbi Itzhak Yosef, met with the Chief Rabbi of Russia Berel Lazar in Moscow last week while on his way to a peace conference in Kazakhstan. The meeting took place at FJC’s Moscow JCC, where Rabbi Yosef was introduced to the wide variety of the center’s educational and cultural programs, including the Jewish Museum and Tolerance Center. Rabbi Yosef said he was pleasantly surprised by the level of religious and cultural activity in the country an the efforts taken by the community leaders to expand the activities. The head rabbis agreed to continue the development of strong socio-cultural ties between the two country’s Jewish communities. Rabbi Yosef, who is professionally involved in the process of kashrut certifications back in Israel, was also interested to learn about the work of FJCR’s department of kashrut. In recent years the amount of kosher food manufactured under the department’s supervision has increased drastically, both for export and for internal use.